Don't return your Note 7 without one of these. After watching $17 billion fall off its market value today, it’s still too early for Samsung to laugh about the whole Galaxy Note 7 debacle. But that doesn’t mean we can’t. 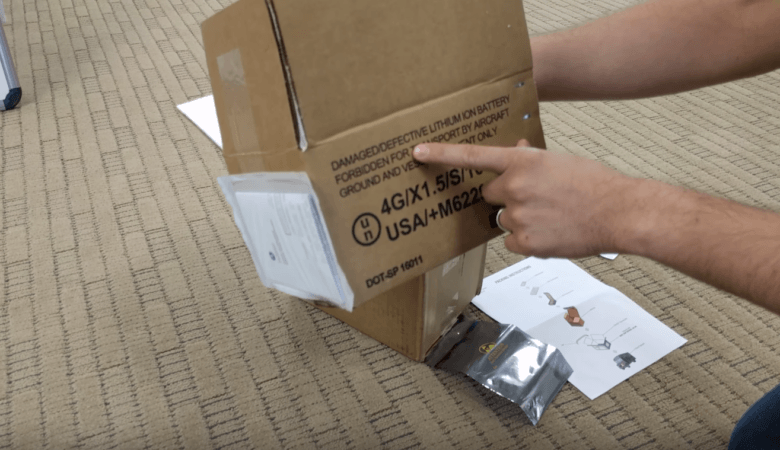 This video of a Note 7 return kit, which includes a fire-proof box and gloves, will certainly put a smile on your face. If you bought your Galaxy Note 7 from a carrier or retail store, returning it is easy. But if you bought yours online, directly from Samsung, it’s a bit more difficult. In the United Kingdom, the Post Office won’t even accept packages that contain the device. Fortunately, Samsung has a solution. Its special Note 7 return kit was designed with explosions in mind, and it includes thermally-insulated packaging with a ceramic fiber paper lining, and gloves that ensure you won’t suffer burns while handling the device. It’s a shame the Note 7’s run has ended like this. It was easily the best smartphone Samsung has ever made, and one of the best devices of 2016. But Samsung clearly cannot fix the issue causing some devices to overheat and catch fire, so it has ceased production altogether. If you still own a Note 7, Samsung has advised that you power it down and return it to wherever you bought it for a refund. And if you happen to see one on sale somewhere, avoid it at all costs and buy something else.